Great cookbooks can inspire you in many ways. Recently, we were flipping through Marcella Hazan's Essentials of Classic Italian Cooking searching for a summer vegetable dish. We started at artichoke, paused at eggplant, continued to escarole, then worked our way through the entire veggie alphabet to Z. Finally, a zucchini recipe caught our eye and we thought it would be perfect for a potluck dinner with new friends. Then, the unexplainable happened. Standing in the grocery store, with a list in hand that actually said "zucchini", we proceeded to load eggplant into our basket. Eight of them. It wasn't like mistakenly grabbing parsley instead of cilantro. That would be an honest mistake. Maybe there's a scientific term for our transposition of vegetables, because brain fade doesn't sound very technical. Eight eggplant are not the easiest thing to use up in one meal, so we started on a few of Marcella's recipes and then were inspired to create one of our own for you. With Marcella, we cooked our way through classic Italian eggplant dishes, so we shifted gears towards French classics. France + eggplant = ratatouille in most cases. This is where we got the itch to doing something different. Maybe it was the cherries and plums that were coming into season that made us think of clafoutis. That had us pondering unexpected food pairings. What if ratatouille and clafoutis had a lovechild? Ratafloutis? It was worth sacrificing an eggplant to find out! Classic recipes never fail to support your creativity. They offer the infrastructure to guarantee the dish's success while allowing you to be daring in how you put your mark on it. Clafoutis is a light custard usually paired with cherries or plums to make a simple dessert. The base isn't very sweet, so it generally relies on ripe fruit to take care of that. Counting on fruit of a different sort, ripe cherry tomatoes slowly cooked with garlic and thyme sweeten our clafoutis. But instead of baking into the dish, we will gently spoon this tomato garlic confit over the top as a sauce. Zucchini and eggplant are among the main ingredients in ratatouille. Slicing them into rounds and baking in the oven for a few minutes ensures that they will be cooked all the way through when they bake inside of the clafoutis. We use baby zucchini since we are playing with shapes, patterns and presentation. The eggplant is arranged in an overlapping circular pattern in an effort to use up as much as we can. Of course a few other goodies make it into our clafoutis to honor true ratatouille flavors. That includes peppers and onions with an addition of some tangy goat cheese. Butter a 10-inch cake pan and cut out a parchment circle to line the bottom. Butter the parchment too. Set aside. Preheat oven to 350 degrees. Combine tomatoes, garlic, thyme and olive oil in an ovenproof dish. Season with salt and pepper. Bake for about 30 minutes until garlic is soft. Remove the thyme sprigs and set aside the Tomato Garlic Confit until serving. Arrange eggplant and zucchini on a sheet pan. Brush lightly with olive oil and season with salt and pepper. Bake in oven for about 20 minutes until just tender, before the vegetables starts to brown and dry up. Flip the vegetables half way through baking. In a medium nonstick skillet, heat olive oil. Add onions and bell peppers. Sauté until softened and onions are translucent. Allow all vegetables to cool slightly before proceeding. In a medium sized bowl, combine eggs, flour, and milk. Whisk until thoroughly combined. 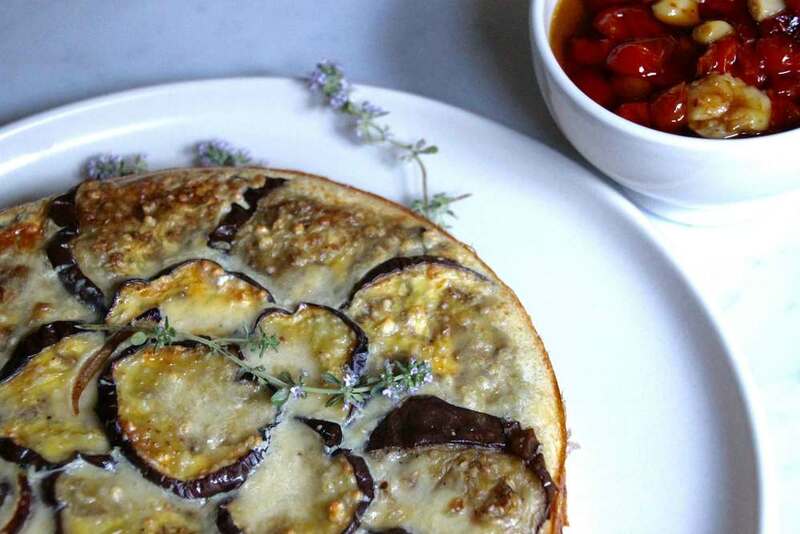 Arrange the eggplant in a circular pattern, filling the bottom of the cake pan. Spread the onion and bell pepper mixture on top. Distribute the goat cheese next and follow with kalamata olives. Finish by adding the zucchini in a circular layer on top. Gently pour the custard mixture over the top. Bake for about 30 minutes until the center of the clafoutis is set and no longer liquid. Allow to cool for several minutes. Flip out onto a serving plate. Use a large knife to cut wedges. Top with tomato confit and serve. Refrigerate any leftovers.